TEHRAN (Tasnim) - Browser extensions was released this week by Microsoft that port the Windows Defender Application Guard technology from Edge to Chrome and Firefox. The extensions only work for Chrome and Firefox running on current Windows Insider builds, but are expected to work with the upcoming Windows 10 stable release, 19H1, scheduled for release later this spring. 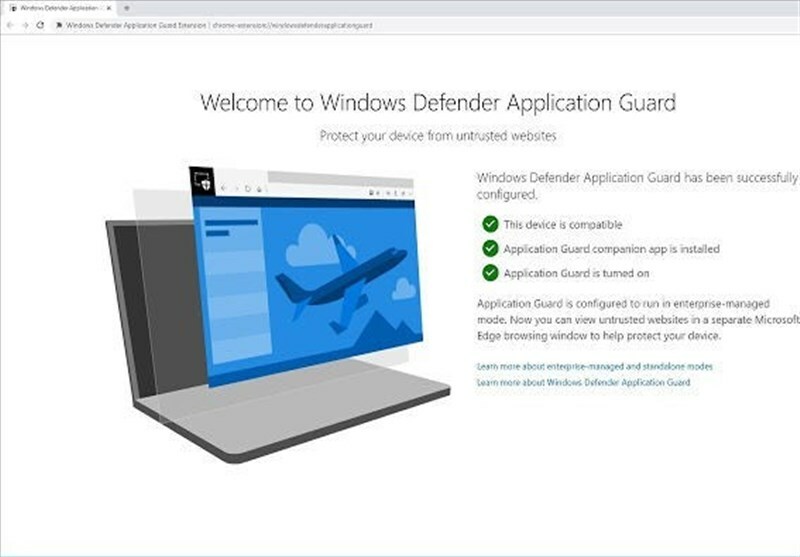 The Windows Defender Application Guard technology is a relatively new Windows Defender security feature that until now has only been available to Edge users, ZDnet reported. According to a Microsoft help page, Windows Defender Application Guard lets enterprise administrators set up a list of trusted websites and local resources that the user can access using Edge. If the user accesses an URL that is not on this list, Windows Defender Application Guard comes into effect and starts a sandboxed session of Edge (an Hyper-V-enabled container) where the new website will be loaded in a safe environment isolated from the rest of the Edge browser and underlying operating system. This way, any potential attack won't be able to reach and grab the user's data, or plant malware on the local operating system. The Chrome and Firefox extensions that Microsoft released this week allow Windows Defender to protect these two browsers in the same way it protects Edge. Every time Chrome and Firefox users will access a website that is not a local list of admin-designated trusted websites, Windows Defender would load the untrusted URL inside a sandboxed Edge browser. Yes, users will be pulled out of their preferred browsers like Chrome and Firefox, but this would be done for security purposes only.